The details that made Sarah and Megan's lesbian wedding magical. In honour of Mamamia’s new wedding planning podcast Hitched, we wanted to celebrate (and perve on) YOUR weddings. 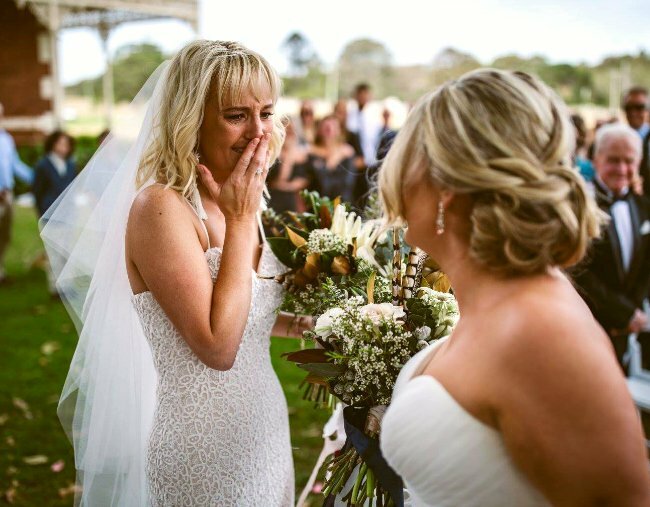 This week’s Wedding of the Week is Sarah and Megan’s laid back party wedding which took place before Australia voted YES for marriage equality. Enjoy! Don’t forget to Subscribe to Hitched here. Sarah and Megan&apos;s love story. "Megan and I met where all good love stories start… online. This was pre-Tinder days and we found each other through a poorly named lesbian-dating app called Brenda. We lived nearly four hours apart but coincidentally found out we had mutual friends. It was destiny." "Megan and I eventually met up and hit it off so there was a lot of driving up and down the coast. Megan moved in with me over her uni holidays and then I moved to Sydney with her while she finished school. We ended up moving back to my small town in country NSW, and bought a house and are proud mothers to our baby (dog). "I was diagnosed with Multiple Sclerosis at 19, two years before Megan and I met. It was tough dealing with it at the start. It was hard for Megan, being a nurse, and wanting to commit to me, even though she was caring for people all day, and then signing up to potentially care for me too. "We got engaged on the October 21, 2016 and started planning our wedding about 11 months in advance. We were obviously extremely excited! To us, marriage is a face full of wrinkles from a lifetime of smiles, being the first thought in the morning and the last thought at night time. And lots of cuddles and snuggles." "I went dress shopping with my sister and cousin, it was awesome. The dress I ended up wearing was completely left field for me. My sister said I should just try it on to rule out that type of dress. But it ended up being the one I chose. We had lots of fun and lots of laughs." "Megan went shopping with my mum. The first day, they couldn&apos;t find anything so we planned to go again. Her experience was pretty relaxing... to begin with. "I knew [everything with the dresses] would fall into place, so I wasn’t worried about the process. Megan, on the other hand, was a punish! She was stressing for months before the wedding, saying she wanted to buy another dress. I have no idea why as she looked absolutely incredible on our day. In the end, she came around. "I definitely had that movie-like &apos;aha&apos; moment. As soon as I saw myself in it I just knew, and when [my sister and cousin] saw me in the dress, they cried. It was the same for Megan, even though both our dresses were very different to what we both thought we&apos;d end up wearing." Sarah and Megan&apos;s bridal hair, makeup and final touches. Sarah and Megan&apos;s jewellery: "A good friend gave us beautiful Thomas Sabo bracelets and we both wore them on the day of our wedding." Other: "Megan wore a veil." "I let the girls around me decide on most things for my bridal style, I&apos;m not too fantastic when it comes to hair and makeup. That said, they wanted my hair in a different style, but it didn&apos;t make me feel like a princess, so we changed it up. Megan&apos;s bridal style was natural makeup with a tinge of rose gold, natural hair - nothing too over the top." "We both felt very confident and beautiful on the day. That was our day to shine and we definitely felt like princesses. Megan has never been confident as the centre of attention, but she definitely stole the show and felt like royalty." Bridesmaid dresses and shoes: Chose and purchased their own. "Megan and I had five bridesmaids each and we were worried about different styles/colours clashing with our dresses for photos, so we thought the best way to ‘blend’ everyone in was for them to all have different styles and colours." "We chose a a complimentary colour palettes for each party [cool tones for Sarah and warmer tones for Megan] that and told the girls to find a dress they liked in that palate. They paid for their own dresses, so they could spend as much/little as they wanted. We couldn’t afford to pay for everything as double bridal parties means double the hair, makeup and bouquets! Not all the girls lived in the same country too, so that process also made it easier to find something they could actually try on and feel comfortable in. "We&apos;re really happy with how it worked out. Being a bridesmaid can cost a lot with the bridal party and travelling costs, so we wanted to make it as cheap as possible for them. The bridesmaids wore their own shoes, we just requested they be beige in colour, and they either bought new ones or wore ones they already owned. We ‘proposed’ to our maids with earrings as a present and they wore them on the day. "Our bridal parties consisted of family and long time friends. They helped us set up, make our signs and wedding favours, and helped with the general flow of the day. The biggest help was having them in charge of anything that could cause extra stress for us on the day! "My gorgeous bridesmaids all have played a massive part in my life, I love them all so much and wouldn&apos;t be the person I am today without their love and support. I&apos;m grateful." Stationery: "We made all of our own signage. Thanks Bunnings!" "My Nan used to love driving past Stanley Park and the beautiful old heritage house on the lake that was built in 1897. When we found out they held weddings there, it was an obvious choice. The whole day could be conducted there and we didn&apos;t want to be travelling from venue to venue on the day. It was also perfect as the house can be hired out for accommodation, so our families were able to stay together. We stayed there the night of the wedding, and also the following night. This allowed us to have a great catch up the next day and night." "The venue also has such a lovely relaxed vibe, which was exactly what we wanted. Our wedding ceremony took place under a huge old fig tree, and the reception followed in the newly-built barn. I cannot speak higher of Stanley Park! Jasmine, the owner, was so accommodating and made the whole process stress-free. "As it wasn&apos;t yet legal for us to &apos;be married&apos; [at the time of our wedding], we didn’t want to pay a celebrant to ‘marry’ us. To Megan and I, our families and all our guests, it was a true marriage, but it just didn’t make sense to us to pay someone. As a teenager, I always joked with one of my best friends Sophie that she could marry me away someday, I still have no idea how that joke even started. We got that wish! "Sophie is not a legal celebrant but nailed the ceremony with such professionalism. It made our wedding ceremony so special. Megan, Sophie and I wrote the whole ceremony together which was probably the most stressful part of the day, as none of us really knew what we were doing! I will only say this once and once only - I guess we can thank the Australian government for not having legalised gay marriage yet because we didn&apos;t need a legal celebrant. It meant so much more being &apos;married&apos; by our dear friend. Another lovely touch was having one of Megan’s good friends sing as we all walked down the aisle. "A Beautiful Occasion were our wedding designers. Amy and Sara are two of the most beautiful human beings you’ll ever meet. They were so amazing and we owe them a lot for making our day as amazing as it was. They had to make 12 bouquets - two for Pinterest-obsessed brides, plus 10 bridesmaids - which was a feat in itself. The food from Sprout was also a stand out for our guests on the day. We had informal cocktail dining that matched the relaxed vibe, and the menu consisted of gourmet bite-sized finger food. Later on, they brought out some larger gourmet entrees such as butter chicken with rice, sliders, and fancy steak sandwiches. "We decided to ‘cut’ the cake tradition from our day, but still wanted to treat our guests without the cliché formalities of smashing cake into one another’s faces. Megan and I decided to have a doughnut table after falling in love with Doughheads in Newcastle. For those that weren’t so doughnut inclined, we also had mini cupcakes and a lolly table that everyone picked at through the evening. "One of our friends generously gifted us with a quality tequila bar as a wedding gift so we treated our guests to a tequila and cigar bar that opened at 9pm. We got some amazing photos of our guests enjoying a tequila and cigar at the end of the night. Megan&apos;s father has always enjoyed a nice cigar so it was a little treat for those who didn’t enjoy ripping up the dance floor. Everyone got into it!" The moments that made Sarah and Megan&apos;s wedding day special. "It sounds so ridiculously cheesy, but honestly, seeing Megan as my bride from across the room surrounded by all our loved ones was the most special part of my day. We always said whoever proposed would walk down the aisle first. All our bridesmaids alternated walking down the aisle before Megan walked down with her father. When Megan got to the end, I walked down with my dad. They were always going to walk us down the aisle, they earned that." "Megan and I both agree our first dance was the most memorable part of the day. Everyone was given a sparkler to light while we were dancing to &apos;Perfect&apos; by Ed Sheeran, and at one point while we were totally focused on each other/trying to not trip over each others dresses, Megan whispered to me, ‘look at everyone’. Looking out and seeing everyone with their sparklers watching us was overwhelmingly beautiful. That was one of the most special moments to me." Would they change anything about their wedding? "Honestly, there is nothing I would have changed about the day itself. It ran so perfectly, without any stress. The day before the wedding was a bit rushed with ceremony rehearsal, getting nails done and organising last minute things we had forgotten (i.e writing our wedding speeches). I wish I had more stress-free time with my bridesmaids the day prior, but considering there were no glitches on the day I think we all did an amazing job. We couldn’t have done it without everyone involved!" "Megan and I really enjoyed the wedding planning process. We both like to be crafty and this kept us up at night as we were so excited to DIY our decor and look for more ideas to make our day just as we wanted. Megan is a complete perfectionist and notices the little things that our guests wouldn’t have looked twice at, which was a bit stressful. When she slightly smudged the ink on one of the signs, the wedding was nearly off - just kidding! We did lots ourselves because we enjoy it and had the time, but I can imagine how stressful it would be doing it all yourselves. That, I wouldn’t recommend unless you had a small space to decorate and talented friends to help. We also had the back up of our wedding designers to tell us if it looked terrible! "Our wedding was expensive. It was a lot of money to spend, but given we needed double of everything (dresses, shoes, hair and makeup, flowers, bridesmaid expenses), and accommodation for 15 people for two nights and all the vendors, it was worth every cent. There is no way we could have afforded it all on our own and we have our parents to thank for generously contributing. "We were given the best advice prior to our wedding: to just take five or 10 private minutes with each other every hour to actually take in the moment. We would get so excited when we would find each other throughout the day to take those moments, it was so nice to stand back together and look at our special day. The day is SOO overwhelming, you are so lost in the moment talking and getting photos with everyone that the time flies. The day is all about your love for one another and it was special to take time out to recognise that part of it." Finding your wedding dress isn&apos;t always like how it looks of Say Yes to the Dress. Good news... it doesn&apos;t have to be! 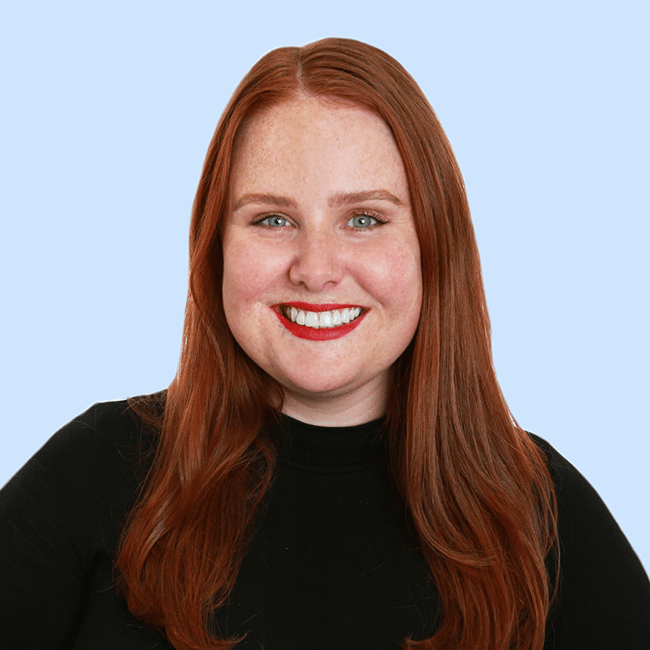 This week, Aleisha McCormack gave us her best advice for finding your perfect wedding outfit. get it in your ears below! All images supplied by the couple and The Wanderers.